Do you have a moody mare? Is your horse not shedding out properly or considered an ‘easy keeper’? Healthy function of the horse pituitary gland is needed! The pituitary gland releases hormones. Hormones regulate various functions, including metabolism, growth and development, tissue functions and mood. 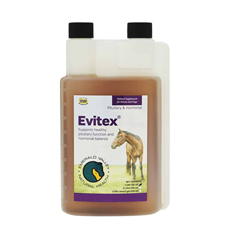 Evitex has gained an outstanding reputation as the natural way to help maintain the health of horses’ hormonal systems. By supporting normal function of the pituitary gland, Evitex may help manage hormonal balance, metabolic function, kidney function, healthy digestion and maintain optimal function of reproductive processes. 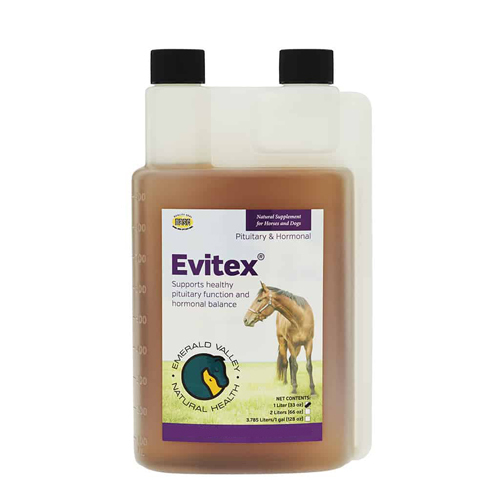 Evitex helps with normal shedding, normal sweating and drinking, healthy muscle tone and overall appearance. Ongoing research shows the many benefits of chasteberry for healthy pituitary, hormone levels and supporting glucose metabolism in horses and dogs. Evitex promotes long-term health and may help reduce the potential negative effects of stress. For information on Cushings please click the additional information tab. PLEASE read Ingredients/Dose tab for directions for use before ordering. Need help determining what size to buy? 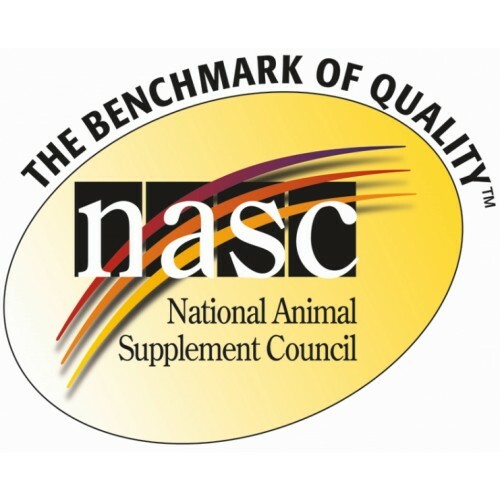 Note: If you are ordering the GALLON size, a 1 or 2 liter dosing bottle, dose syringe or dispensing pump can be ordered here as there is no measuring chamber to accurately dose your horse/dog on the GALLON size. Harvey Cushing in 1932 described a fatal syndrome in humans characterized by unusual disposition of fat depots, osteoporosis, immune suppression, generalized weakness, which was associated with basophilic adenoma of the pituitary gland. This syndrome we now know to be due to elevated concentrations of circulating cortisol of adrenal origin and hyperadrenocorticism has become known as Cushing’s disease. In the horse Cushing’s disease is always secondary to a pituitary adenoma or hyperplasia; pituitary dependent Cushing’s disease (PDCD). An important recent finding (Johnson 2002) has been the identification of a metabolic abnormality due to an abnormal activity of the 11 ß-hydroxysteroid dehydrogenase type 1 enzyme in integumentary tissue of laminitis cases. These cases differ in clinical presentation from PDCD cases in that animals of any age may be affected, they do not show the hirsutism characteristic of advanced PDCD cases and contrastingly they all are, or have been, obese. Whilst the terms Peripheral Cushing’s disease and Equine Metabolic Syndrome have been suggested to describe hypercorticism not of adrenal origin, the term obesity dependent laminitis (ODL) seems the most descriptive and least likely to avoid confusion with PDCD which term may be better restricted to horses suffering hyperadrenocorticism. PDCD in horses appears to be due to insufficient DOPamine being released from the hypothalamus. DOPamine inhibits the pars intermedia of the pituitary gland. Therefore, when there is less DOPamine there is less inhibition of the pars intermedia, which then increases in size. Equine PDCD cases always develop laminitis if they live long enough. They may become immunosuppressed, and subject to a variety of parasitic or infectious agents such as helminthiasis or pneumonia. Many cases show muscle loss and become polydipsic and polyphagic; they may be diabetic. A supra-orbital swelling, due to the deposition of a fat depot, is commonly seen giving the eyes a protuberant appearance. To the trained observer, these cases can be diagnosed on clinical appearance and history alone. Failure to shed their coat in Spring, the coat becomes long, thick and matted. Affected animals tend to sweat more than normal; they lose weight despite an increased appetite. They may become diabetic, either diabetes mellitus, (sugar diabetes) or diabetes insipidus. They therefore drink excessively, and if stabled you will notice their bedding is quickly soaked. They show filling above the eyes. This is fat deposition in the supra-orbital fossae. (Normal horses have depressions above the eyes; you can see these depressions moving when a horse chews). They become depressed and ill-looking, with dull eyes and they lose the shine on their coat. They all develop laminitis eventually. Their body shape changes so that they lose muscle mass, developing a dipped back, poorly muscled neck and quarters with a pendulous abdomen. There is a re-distribution of fat depots. The horse looking thin (“ribby”) but gaining a rather “blocky” appearance. This is particularly evident if it has been dieted in the mistaken belief that its laminitis is due to obesity. Their resistance to infections or worm burdens is reduced. With the plethora of tests used to confirm hypercorticism, which ones are safe for the laminitic and which give most information relating to both forms of “Cushing’s disease”? Whilst the dexamethasone suppression test or the combined ACTH stimulation / DX suppression tests are regarded as providing a definitive diagnosis of hyperadrenocorticism, I have known horses either develop laminitis, or suffer deterioration in a pre-existing laminitis, following their use. Neither test provides any diagnostic information about hypercorticism not of adrenal origin (Obesity Dependent Laminitis; ODL). Whilst a Thyroid Releasing Hormone response test is safe, it is only of value if the horse shows a baseline cortisol concentration within the normal range. Additionally, this test provides too many equivocal results to be reliable as a PDCD test and again is non diagnostic for ODL. A combined Dx suppression / TRH response test has the disadvantages noted for both tests above. The test I use these days is a measurement of endogenous ACTH, cortisol, insulin and glucose. The test is safe for the laminitic, involves one blood sample and is relatively inexpensive. The test should ideally be performed first thing in the morning after the horse has been stabled overnight with no food provided. It is inadvisable to use any of the above tests if the horse is currently suffering from laminitis, the stress of which is likely to cause erroneous results. The presence of plasma endogenous ACTH concentrations greater than 50 pg/ml, elevated serum cortisol, insulin and glucose concentrations is diagnostic of PDCD. Cases with normal endogenous ACTH concentrations (30 pg/ml) but with elevated serum insulin, cortisol and glucose concentrations are diagnostic of insulin resistance and obesity dependent laminitis. Cyproheptadine – Small white tablets (4mg) Effective in about 80% of cases. This drug comes in three strengths so be sure which ones you are using and check the dosage prescribed. The drug is expensive so if you use it make sure the horse eats it! The surest way is to feed it from the hand either in a tidbit or a sandwich. BE AWARE THAT BOTH CYPROHEPTADINE AND PERGOLIDE CAN INITIATE OR AGGRAVATE LIVER DISEASE – your vet can check on this by measuring liver related enzyme and bile acid concentrations in clotted blood samples. The test regime I am using now is to measure endogenous ACTH, cortisol, insulin and glucose from venous blood samples at 0900 hours before the morning feed and in a quiet environment. This is a simple test to use, although the blood cells have to be separated from the plasma and the sample kept frozen prior to testing. This test does not run the risk of inducing or worsening laminitis following the administration of a corticosteroid. It will differentiate between pituitary dependent Cushing’s cases and those animals with obesity related laminitis. Treatments for Pituitary dependent Cushing’s disease In some animals the pituitary pathology seems to result in little disability other than the change in the hair coat. In other more advanced cases recurrent episodes of laminitis result or the animal may eventually succumb to an overwhelming systemic infection. However many cases showing the classical changes in the hair coat can live happily for years before they become laminitic, diabetic or begin to lose condition. Even if the animal has suffered laminitis but in other respects appears well, these cases can be greatly improved by correct foot dressing and/or shoeing. The precise prevalence of pituitary dependent Cushing’s disease is unknown but it is probably quite common in elderly individuals. The youngest case I have seen was 8 years old. If you only realize that your horse has pituitary dependent Cushing’s disease when it gets an attack of laminitis, then the outlook can be grave. In some cases the normal laminitis treatments of acepromazine and phenylbutazone are not “strong” enough to correct the vasoconstriction in the feet. In these cases I have used phenoxybenzamine drips, over 48 hours, successfully. The horse should really be hospitalized if this is to be undertaken. The long term prognosis for Cushing’s Disease cases if bad, if they also have chronic founder then this worsens the prognosis. However there are a couple of drugs which have proved valuable for treatment. The treatment does not cure the change in the pituitary gland but reduces the amount of the hormones which are released from it. These treatments can give horses a good quality of life for 2 years or more. Although the treatments are recommended for year round medication we have found that in many cases treatment can be tailed off then stopped in the Spring and started again in the Autumn. This is because the pituitary gland receives information from the pineal gland (the third eye) indicating the day length. Most horses with Cushing’s Disease come down with laminitis in the Autumn, as day length shortens, and in the Winter. If Cushing’s Disease laminitis cases are left untreated they cannot self-cure and suffer laminitis continually. Some temporary improvement in the clinical condition of about 80% of cases has resulted following treatment with cyproheptadine (Periactin:MSD). However, at best this results in a temporary improvement in the clinical condition of the animal, it has no curative effect. The Laminitis Trust completed a trial using an extract of the plant Monkspepper or Chasteberry (Vitex agnus castus). This herbal extract has shown some promise in controlling the effects of Cushing’s disease in horses. I have encouraged all horse owners over the last 10 years not to allow their horses to become obese, as this puts them at high risk of laminitis. Although we are not sure exactly why this occurs, we do know that many fat horses show insulin resistance, in other words they do not show a lowering of blood sugar concentrations when injected with insulin. Recently, Dr Johnson in the US has suggested a possible explanation. He has suggested that fat horses and ponies may be suffering from a syndrome which has been well recognized in humans, that of Omental Cushing’s disease. In humans, the omentum, a fatty sheet which covers the intestines, becomes an abnormal site for the production of the hormone cortisol. The omentum in these individuals contains an aberrant set of enzymes which convert the person’s own inactive cortisone into the active form cortisol. This increased amount of circulating cortisol has an adverse effect on the horse’s carbohydrate metabolism causing an increased blood glucose and insulin. A similar situation may be occurring in fat horses which show high concentrations of circulating, cortisol, insulin and glucose, are hard to diet and often suffer from laminitis. This syndrome in horses is sometimes referred to as Peripheral Cushing’s disease though I think this is not a very good name as the extra cortisol is not coming from the adrenal gland. The new test we are using, measuring endogenous ACTH, cortisol, insulin and glucose can differentiate pituitary dependent Cushing’s cases from obesity related laminitis. Eiler, H., Oliver, J. and Goble, D. (1979) Combined dexamethasone-suppression cosyntropin-(synthetic ACTH) stimulation tests in the horse; A new approach to testing of adrenal gland function. Am. J. Vet. Res. 40: 724-726. Equine intravenous glucose tolerance test: Glucose and insulin responses of healthy horses fed grain or hay and of horses with pituitary adenoma. Am. J. Vet. Res. 47: 2004-2006.